 Dr. Brian Burke described his ethnographic field work in Columbia as “active immersion—not just ‘being there,’ but laboring to know a place,” (publication pending). I first came to know Martin County, Kentucky through news headlines: Kentucky’s ‘worst’ water system might be only weeks away from collapse (January 26, 2018); Why One County Has Avoided Drinking Its Water For 18 Years (February 8, 2018); The water runs milky and can feel like fire. In this impoverished county, Trump’s $1.5 trillion infrastructure plan may not help (February 12, 2018). In the past couple of months, I’ve been getting to know Martin County from my front porch swing in Quail Hollow in Inez. Mickey McCoy’s grandmother grew up in this house, and Mickey remembers when the yard was filled with a large garden with beans, tomatoes, and all kinds of other vegetables that he would help harvest, preserve, and eat. Most days when I sit out on the porch, I chat with a neighbor who passes my house on the way to visit the elderly couple that lives next door. She told me that soon, we will have to drive up the road that leads to the Big Sandy Federal Prison to watch the elk that pass by there in the evening. I am getting to know Inez at dawn when the mist catches on the mountains and at dusk when the sky colors with the setting sun. I am becoming familiar with the Inez Walking Trail that follows the creek through town. One evening, a county employee shows me to the part of the path where endangered turtles return year after year to lay their eggs. 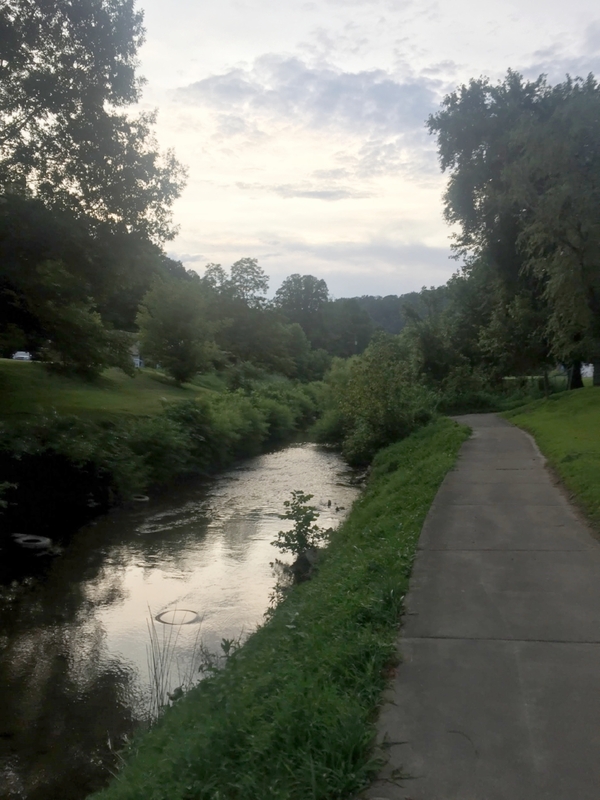 Another evening, my dog Fiddle, and I briefly share in the excitement of a young family who spot a big turtle in the creek while feeding bread to the ducks. I tell them about the time last week when Fiddle tried to chase a group of ducklings on the water. I am learning about Martin County during monthly water board meetings, while reading thousands of pages of legal documents about the Public Service Commission’s investigation into the Martin County Water District, and when combing through the archives at the Mountain Citizen newspaper office on Main Street. I am getting to know Martin County when I buy bottled water at the Walmart in Johnson County, when I buy gas in Floyd County, and when neighbors in Martin County offer me tomatoes, corn, and hot peppers from their backyard gardens. Mostly, I am learning about Martin County through stories: stories of sickness; stories of corruption; stories about water leaks; and stories about high school football games, the annual Harvest Festival and family reunions. This place, like every place, is full of contradiction, complexity, joy and grief, and the experiences of everyday life. Martin County is shaped by decades of extraction with very little investment in water infrastructure; it is also shaped by the people who live, work, and play here. Slowly, I am laboring to know Martin County and listen to its many dreams and visions for the future.